Upon his return to Georgia, he was elevated to the rank of archimandrite and appointed abbot of Chelishi Monastery. Chelishi Monastery had at one time been a center for theological education in Georgia, but many years had passed since then and the monastery’s student body was rapidly shrinking. Before long it would be completely deserted. But with the blessing of Bishop Leonid of Imereti (later Catholicos-Patriarch of All Georgia), St. Ambrose gathered a number of gifted young people to study at the seminary and began to instruct them in chanting and the reading of the Holy Gospel. St. Ambrose devoted much of his time and energy to finding and restoring the old manuscripts of Chelishi Monastery. Once, while passing through the monastery yard, he heard a muted sound coming from beneath the earth. He began to dig at that place and discovered an ancient copy of the Holy Gospels. It was the “Chelishi Gospel,” a famous Georgian relic from the 9th or 10th century. Soon St. Ambrose joined the Tbilisi Synodal Council and was enthroned as abbot of Holy Transfiguration Monastery in Tbilisi. But in 1908 he was accused of conspiring in the murder of the exarch Nikon and deprived of the right to serve in the Church. The prosecutors exiled him to the Holy Trinity Monastery in Ryazan, where he spent over a year under strict guard. In 1910 St. Ambrose was acquitted and again permitted to serve in the Church. In 1917 Archimandrite Ambrose returned to Georgia and rejoined the struggle for an autocephalous Georgian Church. Within a few months the Church's autocephaly was proclaimed. 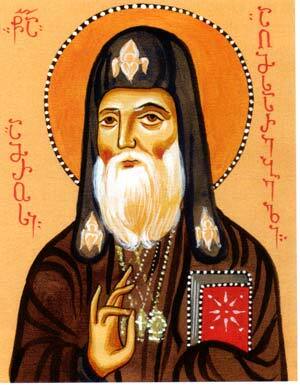 He was consecrated Metropolitan of Chqondidi, later to be transferred to the Tskum-Abkhazeti region. In 1921 St. Ambrose was enthroned Catholicos-Patriarch of All Georgia. The Soviet government began to persecute the Church not long after St. Ambrose’s enthronement. Some 1,200 churches were plundered, converted for other purposes, or destroyed. A great number of clergy were arrested, exiled, and later shot to death. On February 7, 1922, Catholicos-Patriarch Ambrose, the spiritual father and chief shepherd of his nation, sent a memorandum to participants in the Conference of Genoa (In 1922 representatives of thirty-four nations met in Genoa, Italy to discuss the economic reconstruction of Central and Eastern Europe and to improve relations between the Soviet Union and Western Europe.) in which he defended the rights of the Georgian Church and nation. Every word of his appeal was penetrated with distress for the fate not only of his motherland but of the entire human race. St. Ambrose assured his audience that a nation and government deprived of Christian virtue would have no future and pleaded for help in this time of misfortune. The receipt of such a memorandum was unprecedented for the Bolshevik regime, and in response the officials had St. Ambrose arrested. Nevertheless, he fearlessly criticized the government’s complaisance with acts of crime, injustice, and sacrilege. St. Ambrose spoke these remarkable last words to his persecutors: “My soul belongs to God, my heart to my motherland, and with my flesh you may do whatever you wish.” The court sentenced the Catholicos-Patriarch of All Georgia to seven years, nine months and twenty-eight days in prison. At the end of 1924 St. Ambrose and the other members of the Synodal Council were granted amnesty, but their grave experience had already taken its toll. The Georgian flock lost its faithful shepherd in 1927.